Die Arbeitsgruppe bearbeitet ein breites Spektrum von Projekten aus den Bereichen der statistischen Physik weicher Materie und biologischer Systeme. Neben Frage- stellungen im thermischen Gleichgewicht werden vor allem Systeme untersucht, die durch externe Felder im Nichtgleichgewicht gehalten werden oder von sich heraus einen Nichtgleichgewichtszustand annehmen, wie zum Beispiel aktive Brownsche Teilchen. Dabei lassen wir uns von hochaktuellen Forschungsgebieten wie der Mikrofluidik und Biofluiddynamik leiten. Derzeit ist ein Schwerpunkt unserer Forschung die aktive Bewegung in künstlichen und in biologischen Systemen. Dabei geht es um das Verständnis von Design- prinzipen zur Generierung aktiver Bewegung, um deren generische Eigenschaften und um kollektives Verhalten. 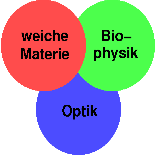 Der Artikel von Maryam wird im Journal Club for Condensed Matter Physics  besprochen. Wir gratulieren Felix Rühle. Seine Masterarbeit wurde von Springer Spektrum zur Veröffentlichung  in der Schriftenreihe BestMaster ausgewählt. Bitte melden Sie sich direkt über das SAP-System an. Microorganisms use chemotaxis, regulated by internal complex chemical pathways, to swim along chemical gradients to find better living conditions. Artificial microswimmers can mimic such a strategy by a pure physical process called diffusiophoresis, where they drift and orient along the gradient in a chemical density field. Similarly, for other forms of taxis in nature such as photo- or thermotaxis the phoretic counterpart exists. In this Account, we concentrate on the chemotaxis of self-phoretic active colloids. They are driven by self-electro- and diffusiophoresis at the particle surface and thereby acquire a swimming speed. During this process, they also produce nonuniform chemical fields in their surroundings through which they interact with other colloids by translational and rotational diffusiophoresis. In combination with active motion, this gives rise to effective phoretic attraction and repulsion and thereby to diverse emergent collective behavior. A particular appealing example is dynamic clustering in dilute suspensions first reported by a group from Lyon. A subtle balance of attraction and repulsion causes very dynamic clusters, which form and resolve again. This is in stark contrast to the relatively static clusters of motility-induced phase separation at larger densities. To treat chemotaxis in active colloids confined to a plane, we formulate two Langevin equations for position and orientation, which include translational and rotational diffusiophoretic drift velocities. The colloids are chemical sinks and develop their long-range chemical profiles instantaneously. For dense packings, we include screening of the chemical fields. We present a state diagram in the two diffusiophoretic parameters governing translational, as well as rotational, drift and, thereby, explore the full range of phoretic attraction and repulsion. The identified states range from a gaslike phase over dynamic clustering states 1 and 2, which we distinguish through their cluster size distributions, to different types of collapsed states. The latter include a full chemotactic collapse for translational phoretic attraction. 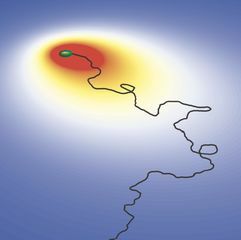 Turning it into an effective repulsion, with increasing strength first the collapsed cluster starts to fluctuate at the rim, then oscillates, and ultimately becomes a static collapsed cloud. We also present a state diagram without screening. Finally, we summarize how the famous Keller−Segel model derives from our Langevin equations through a multipole expansion of the full one-particle distribution function in position and orientation. The Keller−Segel model gives a continuum equation for treating chemotaxis of microorganisms on the level of their spatial density. Our theory is extensible to mixtures of active and passive particles and allows to include a dipolar correction to the chemical field resulting from the dipolar symmetry of Janus colloids. We report the onset of elastic turbulence in a two-dimensional Taylor-Couette geometry using numerical solutions of the Oldroyd-B model generated with the program OpenFOAM®. 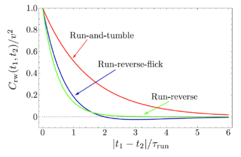 Beyond a critical Weissenberg number, an elastic instability causes a supercritical transition from the laminar Taylor-Couette flow to a turbulent flow. The order parameter, the time average of secondary-flow strength, follows the scaling law Φ∝ Wi -Wicγ with Wic=10 and γ= 0.45 . Additionally, the flow resistance increases beyond Wic . The temporal power spectra of the velocity fluctuations show a power-law decay with a characteristic exponent in the range 2< α < 4 , which strongly depends on the radial position. 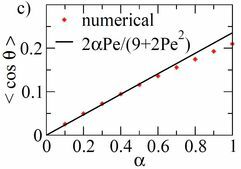 The characteristic exponent β for the spatial power spectra obeys the necessary condition β > 3 , associated with elastic turbulence, for all Wi > Wic . 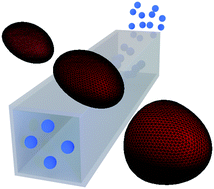 Photoresponsive surfactants provide a unique microfluidic driving mechanism. Since they switch between two molecular shapes under illumination and thereby affect surface tension of fluid interfaces, Marangoni flow along the interface occurs. To describe the dynamics of the surfactant mixture at a planar interface, we formulate diffusion–advection–reaction equations for both surfactant densities. They also include adsorption from and desorption into the neighboring fluids and photoisomerization by light. We then study how the interface responds when illuminated by spots of light. Switching on a single light spot, the density of the switched surfactant spreads in time and assumes an exponentially decaying profile in steady state. Simultaneously, the induced radial Marangoni flow reverses its flow direction from inward to outward. We use this feature to set up specific feedback rules, which couple the advection velocities sensed at the light spots to their intensities. As a result two neighboring spots switch on and off alternately. Extending the feedback rule to light spots arranged on the vertices of regular polygons, we observe periodic switching patterns for even-sided polygons, where two sets of next-nearest neighbors alternate with each other. 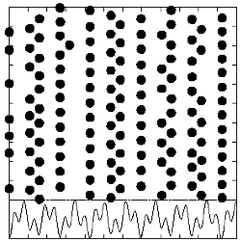 A triangle and pentagon also show regular oscillations, while heptagon and nonagon exhibit irregular oscillations due to frustration. While our findings are specific to the chosen set of parameters, they show how complex patterns at photoresponsive fluid interfaces emerge from simple feedback coupling. Active particles, which interact hydrodynamically, display a remarkable variety of emergent collective phenomena. We use squirmers to model spherical microswimmers and explore the collective behavior of thousands of them under the influence of strong gravity using the method of multiparticle collision dynamics for simulating fluid flow. The sedimentation profile depends on the ratio of swimming to sedimentation velocity as well as on the squirmer type. It shows close packed squirmer layers at the bottom and a highly dynamic region with exponential density dependence towards the top. The mean vertical orientation of the squirmers strongly depends on height. For swimming velocities larger than the sedimentation velocity, squirmers show strong convection in the exponential region. We quantify the strength of convection and the extent of convection cells by the vertical current density and its current dipole, which are large for neutral squirmers as well as for weak pushers and pullers. We present a numerical study of dense colloidal suspensions in a pressure-driven microchannel flow in two dimensions. The colloids are modeled as elastic and frictional spheres suspended in a Newtonian fluid, which we simulate using the method of multiparticle collision dynamics. The model reproduces periodic velocity and density pulse trains, traveling upstream in the microchannel, which are found in experiments conducted by Isa et al. [Phys. Rev. Lett. 102, 058302 (2009)]. We show that colloid-wall friction and the resultant force chains are crucial for the formation of these pulses. With an increasing colloid density, first solitary jams occur, which become periodic pulse trains at intermediate densities and unstable solitary pulses at high densities. We formulate a phenomenological continuum model and show how these spatiotemporal flow and density profiles can be understood as homoclinic and periodic orbits in travelingwave equations. Experimental studies of systems containing active proteins that undergo conformational changes driven by catalytic chemical reactions have shown that the diffusion coefficients of passive tracer particles and active molecules are larger than the corresponding values when chemical activity is absent. Various mechanisms have been proposed for such behavior, including, among others, force dipole interactions of molecular motors moving on filaments and collective hydrodynamic effects arising from active proteins. 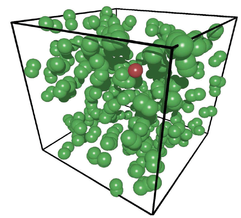 Simulations of a multi-component system containing active dumbbell molecules that cycle between open and closed states, a passive tracer particle and solvent molecules are carried out. Consistent with experiments, it is shown that the diffusion coefficients of both passive particles and the dumbbells themselves are enhanced when the dumbbells are active. The dependence of the diffusion enhancement on the volume fraction of dumbbells is determined, and the effects of crowding by active dumbbell molecules are shown to differ from those due to inactive molecules. The mechanical deformability of single cells is an important indicator for various diseases such as cancer, blood diseases and inflammation. Lab-on-a-chip devices allow to separate such cells from healthy cells using hydrodynamic forces. We perform hydrodynamic simulations based on the latticeBoltzmann method and study the behavior of an elastic capsule in a microfluidic channel flow in the inertial regime. While inertial lift forces drive the capsule away from the channel center, its deformability favors migration in the opposite direction. Balancing both migration mechanisms, a deformable capsule assembles at a specific equilibrium distance depending on its size and deformability. We find that this equilibrium distance is nearly independent of the channel Reynolds number and falls on a single master curve when plotted versus the Laplace number. We identify a similar master curve for varying particle radius. In contrast, the actual deformation of a capsule strongly depends on the Reynolds number. The lift-force profiles behave in a similar manner as those for rigid particles. Using the Saffman effect, the capsule’s equilibrium position can be controlled by an external force along the channel axis. While rigid particles move to the center when slowed down, very soft capsules show the opposite behavior. Interestingly, for a specific control force particles are focused on the same equilibrium position independent of their deformability. Biological microswimmers often inhabit a porous or crowded environment such as soil. In order to understand how such a complex environment influences their spreading, we numerically study noninteracting active Brownian particles (ABPs) in a two-dimensional random Lorentz gas. Close to the percolation transition in the Lorentz gas, they perform the same subdiffusive motion as ballistic and diffusive particles. However, due to their persistent motion they reach their long-time dynamics faster than passive particles and also show superdiffusive motion at intermediate times. While above the critical obstacle density ηc the ABPs are trapped, their long-time diffusion below ηc is strongly influenced by the propulsion speed v0. With increasing v0, ABPs are stuck at the obstacles for longer times. Thus, for large propulsion speed, the long-time diffusion constant decreases more strongly in a denser obstacle environment than for passive particles. This agrees with the behavior of an effective swimming velocity and persistence time, which we extract from the velocity autocorrelation function. Many bacteria perform a run-and-tumble random walk to explore their surrounding and to perform chemotaxis. In this article we present a novel method to infer the relevant parameters of bacterial motion from experimental trajectories including the tumbling events. We introduce a stochastic model for the orientation angle, where a shot-noise process initiates tumbles, and analytically calculate conditional moments, reminiscent of Kramers-Moyal coefficients. 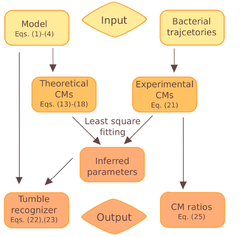 Matching them with the moments calculated from experimental trajectories of the bacteria E. coli and Pseudomonas putida, we are able to infer their respective tumble rates, the rotational diffusion constants, and the distributions of tumble angles in good agreement with results from conventional tumble recognizers. We also define a novel tumble recognizer, which explicitly quantifies the error in recognizing tumbles. In the presence of a chemical gradient we condition the moments on the bacterial direction of motion and thereby explore the chemotaxis strategy. For both bacteria we recover and quantify the classical chemotactic strategy, where the tumble rate is smallest along the chemical gradient. In addition, for E. coli we detect some cells, which bias their mean tumble angle towards smaller values. Our findings are supported by a scaling analysis of appropriate ratios of conditional moments, which are directly calculated from experimental data. A striking feature of the collective behavior of spherical microswimmers is that for sufficiently strong self-propulsion they phase-separate into a dense cluster coexisting with a low-density disordered surrounding. Extending our previous work, we use the squirmer as a model swimmer and the particle- based simulation method of multi-particle collision dynamics to explore the influence of hydrodynamics on their phase behavior in a quasi-two-dimensional geometry. 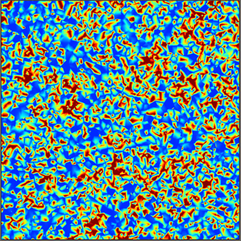 The coarsening dynamics towards the phase-separated state is diffusive in an intermediate time regime followed by a final ballistic compactification of the dense cluster. We determine the binodal lines in a phase diagram of Péclet number versus density. Interestingly, the gas binodals are shifted to smaller densities for increasing mean density or dense-cluster size, which we explain using a recently introduced pressure balance [S. C. Takatori, et al., Phys. Rev. Lett. 2014, 113, 028103] extended by a hydrodynamic contribution. Furthermore, we find that for pushers and pullers the binodal line is shifted to larger Péclet numbers compared to neutral squirmers. Finally, when lowering the Péclet number, the dense phase transforms from a hexagonal ‘‘solid’’ to a disordered ‘‘fluid’’ state. A diverse range of natural and artificial self-propelled particles are known and are used nowadays. Among them, active Brownian particles (ABPs) and run-and-tumble particles (RTPs) are two important classes. 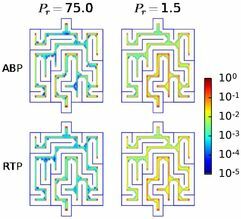 We numerically study non-interacting ABPs and RTPs strongly confined to different maze geometries in two dimensions. We demonstrate that by means of geometrical confinement alone, ABPs are separable from RTPs. 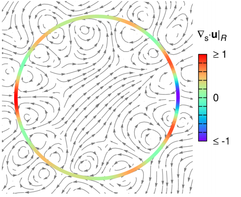 By investigating Matryoshka-like mazes with nested shells, we show that a circular maze has the best filtration efficiency. Results on the mean first-passage time reveal that ABPs escape faster from the center of the maze, while RTPs reach the center from the rim more easily. According to our simulations and a rate theory, which we developed, ABPs in steady state accumulate in the outermost region of the Matryoshka-like mazes, while RTPs occupy all locations within the maze with nearly equal probability. These results suggest a novel technique for separating different types of self-propelled particles by designing appropriate confining geometries without using chemical or biological agents. Microorganisms naturally move in microstructured fluids. Using the simulation method of multi-particle collision dynamics, we study in two dimensions an undulatory Taylor line swimming in a microchannel and in a cubic lattice of obstacles, which represent simple forms of a microstructured environment. In the microchannel the Taylor line swims at an acute angle along a channel wall with a clearly enhanced swimming speed due to hydrodynamic interactions with the bounding wall. While in a dilute obstacle lattice swimming speed is also enhanced, a dense obstacle lattice gives rise to geometric swimming. This new type of swimming is characterized by a drastically increased swimming speed. Since the Taylor line has to fit into the free space of the obstacle lattice, the swimming speed is close to the phase velocity of the bending wave traveling along the Taylor line. While adjusting its swimming motion within the lattice, the Taylor line chooses a specific swimming direction, which we classify by a lattice vector. When plotting the swimming velocity versus the magnitude of the lattice vector, all our data collapse on a single master curve. 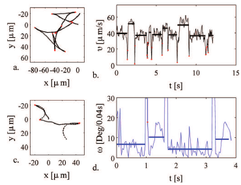 Finally, we also report more complex trajectories within the obstacle lattice. A micron-sized droplet of bromine water immersed in a surfactant-laden oil phase can swim (S.Thutupalli, R. Seemann, S. Herminghaus, New J. Phys. 13 073021 (2011). The bromine reacts with thesurfactant at the droplet interface and generates a surfactant mixture. It can spontaneously phase-separatedue to solutocapillary Marangoni flow, which propels the droplet. We model the system by a diffusion-advection-reaction equation for the mixture order parameter at the interface including thermal noise andcouple it to fluid flow. Going beyond previous work, we illustrate the coarsening dynamics of the surfactantmixture towards phase separation in the axisymmetric swimming state. Coarsening proceeds in two steps:an initially slow growth of domain size followed by a nearly ballistic regime. On larger time scales thermalfluctuations in the local surfactant composition initiates random changes in the swimming direction andthe droplet performs a persistent random walk, as observed in experiments. Numerical solutions show thatthe rotational correlation time scales with the square of the inverse noise strength. We confirm this scalingby a perturbation theory for the fluctuations in the mixture order parameter and thereby identify theactive emulsion droplet as an active Brownian particle. To initiate tumbling of an E. coli, one of the helical flagella reverses its sense of rotation. 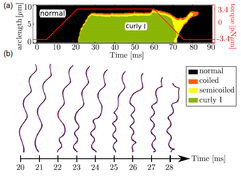 It then transforms from its normal form first to the transient semicoiled state and subsequently to the curly-I state. The dynamics of polymorphism is effectively modeled by describing flagellar elasticity through an extended Kirchhoff free energy. However, the complete landscape of the free energy remains undetermined because the ground state energies of the polymorphic forms are not known. We investigate how variations in these ground state energies affect the dynamics of a reversely rotated flagellum of a swimming bacterium. We find that the flagellum exhibits a number of distinct dynamical states and comprehensively summarize them in a state diagram. As a result, we conclude that tuning the landscape of the extended Kirchhoff free energy alone cannot generate the intermediate full-length semicoiled state. However, our model suggests an ad hoc method to realize the sequence of polymorphic states as observed for a real bacterium. Since the elastic properties of bacterial flagella are similar, our findings can easily be extended to other peritrichous bacteria. Active colloids are microscopic particles, which self-propel through viscous fluids by converting energy extracted from their environment into directed motion. We first explain how artificial microswimmers move forward by generating near-surface flow fields via self-phoresis or the self-induced Marangoni effect. We then discuss generic features of the dynamics of single active colloids in bulk and in confinement, as well as in the presence of gravity, field gradients, and fluid flow. 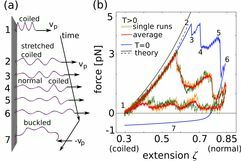 In the third section, we review the emergent collective behavior of active colloidal suspensions, focusing on their structural and dynamic properties. After summarizing experimental observations, we give an overview of the progress in modeling collectively moving active colloids. While active Brownian particles are heavily used to study collective dynamics on large scales, more advanced methods are necessary to explore the importance of hydrodynamic and phoretic particle interactions. Finally, the relevant physical approaches to quantify the emergent collective behavior are presented. Polymer networks at the margins of mechanical stability are known to be highly sensitive to applied forces and fields and to exhibit an anomalously large resistance to deformation. In this paper, we study the effects of hydrodynamic interactions on the behavior of marginal networks using a hybrid molecular dynamics and multiparticle collision dynamics simulation technique. We examine how the filament and solvent properties affect the response of marginal networks to shear. We find that the stiffening of the network shows a stronger dependence on the shear frequency when hydrodynamic interactions are present than when they are not. 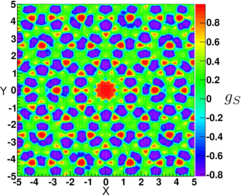 The network shear modulus scales as G ∼ ωαc , with a critical stiffening exponent αc that can be controlled by varying the relative concentrations of the network and the solvent. Our results show that this arises due to the solvent aiding the relaxation of the network and suppressing the network nonaffinity, with the system deforming more affinely when hydrodynamic interactions are maximized. Recent experiments have demonstrated that in a dense monolayer of photo-switchable dye methyl-red molecules the relaxation of an initial birefringence follows a power-law decay, typical for glass-like dynamics. The slow relaxation can efficiently be controlled and accelerated by illuminating the monolayer with circularly polarized light, which induces trans-cis isomerization cycles. To elucidate the microscopic mechanism, we develop a two-dimensional molecular model in which the trans and cis isomers are represented by straight and bent needles, respectively. As in the experimental system, the needles are allowed to rotate and to form overlaps but they cannot translate. The out-ofequilibrium rotational dynamics of the needles is generated using kinetic Monte Carlo simulations. We demonstrate that, in a regime of high density and low temperature, the power-law relaxation can be traced to the formation of spatio-temporal correlations in the rotational dynamics, i.e., dynamic heterogeneity. We also show that the nearly isotropic cis isomers can prevent dynamic heterogeneity from forming in the monolayer and that the relaxation then becomes exponential. The Marangoni effect refers to fluid flow induced by a gradient in surface tension at a fluid-fluid interface. 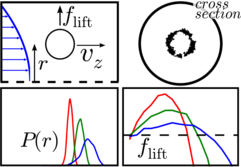 We determine the full three-dimensional Marangoni flow generated by a non-uniform surface tension profile at the interface of a self-propelled spherical emulsion droplet. For all flow fields inside, outside, and at the interface of the droplet, we give analytical formulas. We also calculate the droplet velocity vector v_D, which describes the swimming kinematics of the droplet, and generalize the squirmer parameter β, which distinguishes between different swimmer types called neutral, pusher, or puller. In the second part of this paper, we present two illustrative examples, where the Marangoni effect is used in active emulsion droplets. First, we demonstrate how micelle adsorption can spontaneously break the isotropic symmetry of an initially surfactant-free emulsion droplet, which then performs directed motion. Second, we think about light-switchable surfactants and laser light to create a patch with a different surfactant type at the droplet interface. Depending on the setup such as the wavelength of the laser light and the surfactant type in the outer bulk fluid, one can either push droplets along unstable trajectories or pull them along straight or oscillatory trajectories regulated by specific parameters. We explore these cases for strongly absorbing and for transparent droplets. Microbial colonies are experimental model systems for studying the colonization of new territory by biological species through range expansion. We study a generalization of the two-species Eden model, which incorporates local frequency-dependent selection, in order to analyze how social interactions between two species influence surface roughness of growing microbial colonies. The model includes several classical scenarios from game theory. We then concentrate on an expanding public goods game, where either cooperators or defectors take over the front depending on the system parameters. We analyze in detail the critical behavior of the nonequilibrium phase transition between global cooperation and defection and thereby identify a new universality class of phase transitions dealing with absorbing states. At the transition, the number of boundaries separating sectors decays with a novel power law in time and their superdiffusive motion crosses over from Eden scaling to a nearly ballistic regime. In parallel, the width of the front initially obeys Eden roughening and, at later times, passes over to selective roughening. The course of a peritrichous bacterium, such as E. coli, crucially depends on the level of synchronization and self-organization of several rotating flagella.However, the rotation of each flagellumgenerates countermovements of the body which in turn affect the flagellar dynamics. Using a detailed numerical model of an E. coli, we demonstrate that flagellar entanglement, besides fluid flow relative to the moving body, dramatically changes the dynamics of flagella from that compared to anchored flagella. In particular, bundle formation occurs through a zipping motion in a remarkably rapid time, affected little by initial flagellar orientation. A simplified analytical model supports our observations. Finally, we illustrate how entanglement, hydrodynamic interactions, and body movement contribute to zipping and bundling. We perform extensive Monte Carlo simulations of a two-dimensional bent hard-needle model in both its chiral zig-zag and its achiral bow-shape configurations and present their phase diagrams. 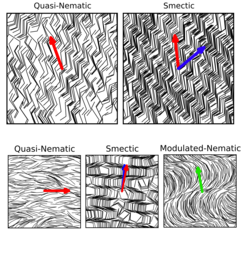 We find evidence for a variety of stable phases: isotropic, quasi-nematic, smectic-C, anti-ferromorphic smectic-A, and modulated-nematic. This last phase consists of layers formed by supramolecular arches. They create a modulation of the molecular polarity whose period is sensitively controlled by molecular geometry. We identify transition densities using correlation functions together with appropriately defined order parameters and compare them with predictions from Onsager theory. 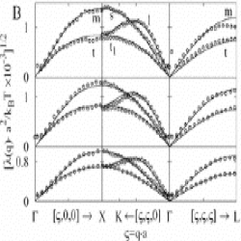 The contribution of the molecular excluded area to deviations from Onsager theory and simple liquid crystal phase morphology is discussed. We demonstrate the isotropic–quasi-nematic transition to be consistent with a Kosterlitz-Thouless disclination unbinding scenario. After colliding with a surface, microswimmers reside there during the detention time. They accumulate and may form complex structures such as biofilms. We introduce a general framework to calculate the distribution of detention times using the method of first-passage times and study how rotational noise and hydrodynamic interactions influence the escape from a surface. 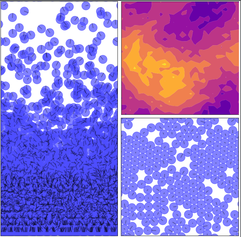 We compare generic swimmer models to the simple active Brownian particle. 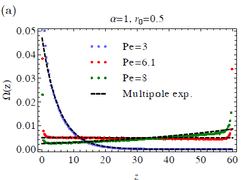 While the respective detention times of source dipoles are smaller, the ones of pullers are larger by up to several orders of magnitude, and pushers show both trends. We apply our results to the more realistic squirmer model, for which we use lubrication theory, and validate them by simulations with multiparticle collision dynamics. Our aim is to explore strategies of feedback control to design and stabilize novel dynamic flow patterns in model systems of complex fluids. To introduce the control strategies, we investigate the simple Newtonian fluid at low Reynolds number in a circular geometry. Then, the fluid vorticity satisfies a diffusion equation. 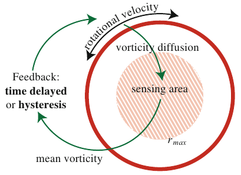 We determine the mean vorticity in the sensing area and use two control strategies to feed it back into the system by controlling the angular velocity of the circular boundary. Hysteretic feedback control generates self-regulated stable oscillations in time, the frequency of which can be adjusted over several orders of magnitude by tuning the relevant feedback parameters. Time-delayed feedback control initiates unstable vorticity modes for sufficiently large feedback strength. For increasing delay time, we first observe oscillations with beats and then regular trains of narrow pulses. Close to the transition line between the resting fluid and the unstable modes, these patterns are relatively stable over long times. We used microfluidic tools and high-speed time-lapse microscopy to record trajectories of the soil bacterium Pseudomonas putida in a confined environment with cells swimming in close proximity to a glass-liquid interface. While the general swimming pattern is preserved, when compared to swimming in the bulk fluid, our results show that cells in the presence of two solid boundaries display more frequent reversals in swimming direction and swim faster. Additionally, we observe that run segments are no longer straight and that cells swim on circular trajectories, which can be attributed to the hydrodynamic wall effect. Using the experimentally observed parameters together with a recently presented analytic model for a run-reverse random walker, we obtained additional insight on how the spreading behavior of a cell population is affected under confinement. While on short time scales, the mean square displacement of confined swimmers grows faster as compared to the bulk fluid case, our model predicts that for large times the situation reverses due to the strong increase in effective rotational diffusion. The flagellate Trypanosoma brucei, which causes the sleeping sickness when infecting a mammalian host, goes through an intricate life cycle. It has a rather complex propulsion mechanism and swims in diverse microenvironments. These continuously exert selective pressure, to which the trypanosome adjusts with its architecture and behavior. As a result, the trypanosome assumes a diversity of complex morphotypes during its life cycle. However, although cell biology has detailed form and function of most of them, experimental data on the dynamic behavior and development of most morphotypes is lacking. Here we show that simulation science can predict intermediate cell designs by conducting specific and controlled modifications of an accurate, nature-inspired cell model, which we developed using information from live cell analyses. The cell models account for several important characteristics of the real trypanosomal morphotypes, such as the geometry and elastic properties of the cell body, and their swimming mechanism using an eukaryotic flagellum. We introduce an elastic network model for the cell body, including bending rigidity and simulate swimming in a fluid environment, using the mesoscale simulation technique called multi-particle collision dynamics. The in silico trypanosome of the bloodstream form displays the characteristic in vivo rotational and translational motility pattern that is crucial for survival and virulence in the vertebrate host. 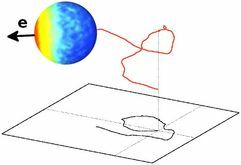 Moreover, our model accurately simulates the trypanosome’s tumbling and backward motion. We show that the distinctive course of the attached flagellum around the cell body is one important aspect to produce the observed swimming behavior in a viscous fluid, and also required to reach the maximal swimming velocity. Changing details of the flagellar attachment generates less efficient swimmers. We also simulate different morphotypes that occur during the parasite’s development in the tsetse fly, and predict a flagellar course we have not been able to measure in experiments so far. We consider a carpet of self-propelled particles at the liquid-gas interface of a liquid film on a solid substrate. The particles exert an excess pressure on the interface and also move along the interface while the swimming direction changes due to rotational diffusion. We study the intricate influence of these self-propelled insoluble surfactants on the stability of the film surface and show that depending on the strength of in-surface rotational diffusion and the absolute value of the in-surface swimming velocity, several characteristic instability modes can occur. In particular, rotational diffusion can either stabilize the film or induce instabilities of different character. Recent experiments with self-phoretic particles at low concentrations show a pronounced dynamic clustering [I. Theurkauff et al.,Phys. Rev. Lett. 108, 268303 (2012)]. We model this situation by taking into account the translational and rotational diffusiophoretic motion, which the active particles perform in their self-generated chemical field. Our Brownian dynamics simulations show pronounced dynamic clustering only when these two phoretic contributions give rise to competing attractive and repulsive interactions, respectively. We identify two dynamic clustering states and characterize them by power-law-exponential distributions. In case of mere attraction a chemotactic collapse occurs directly from the gaslike into the collapsed state, which we also predict by mapping our Langevin dynamics on the Keller-Segel model for bacterial chemotaxis. Hydrodynamically interacting active particles in an external harmonic potential form a self-assembled fluid pump at large enough Péclet numbers. Here, we give a quantitative criterion for the formation of the pump and show that particle orientations align in the self-induced flow field in surprising analogy to ferromagnetic order where the active Péclet number plays the role of inverse temperature. 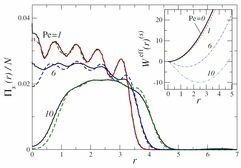 The particle orientations follow a Boltzmann distribution Φ(p) ∼ exp(Ap_z) where the ordering mean field A scales with the active Péclet number and polar order parameter. The mean flow field in which the particles’ swimming directions align corresponds to a regularized Stokeslet with strength proportional to swimming speed. Analytic mean-field results are compared with results from Brownian dynamics simulations with hydrodynamic interactions included and are found to capture the self-induced alignment very well. Inertial microfluidics is a promising tool for many lab-on-a-chip applications. Particles in channel flows with Reynolds numbers above one undergo cross-streamline migration to a discrete set of equilibrium positions in square and rectangular channel cross sections. This effect has been used extensively for particle sorting and the analysis of particle properties. Using the lattice Boltzmann method, we determined the equilibrium positions in square and rectangular cross sections and classify their types of stability for different Reynolds numbers, particle sizes, and channel aspect ratios. Our findings thereby help to design microfluidic Received 3rd February 2014, channels for particle sorting. Furthermore, we demonstrated how an axial control force, which slows down the particles and shifts the stable equilibrium position towards the channel center. Ultimately, the particles then stay on the centerline for forces exceeding the threshold value. This effect is sensitive to the particle size and channel Reynolds number and therefore suggests an efficient method for particle separation. In combination with a hysteretic feedback scheme, we can even increase the particle throughput. In inertial microfluidics lift forces cause a particle to migrate across streamlines to specific positions in the cross section of a microchannel. We control the rotational motion of a particle and demonstrate that this allows to manipulate the lift-force profile and thereby the particle’s equilibrium positions. We perform two-dimensional simulation studies using the method of multi-particle collision dynamics. Particles with unconstrained rotational motion occupy stable equilibrium positions in both halfs of the channel while the center is unstable. When an external torque is applied to the particle, two equilibrium positions annihilate by passing a saddle-node bifurcation and only one stable fixpoint remains so that all particles move to one side of the channel. In contrast, non-rotating particles accumulate in the center and are pushed into one half of the channel when the angular velocity is fixed to a non-zero value. We study the collective motion of confined spherical microswimmers such as active colloids which we model by so-called squirmers. To simulate hydrodynamic flow fields including thermal noise, we use the method of multiparticle collision dynamics. We demonstrate that hydrodynamic near fields acting between squirmers as well as between squirmers and bounding walls crucially determine their collective motion. In particular, with increasing density we observe a clear phase separation into a gaslike and cluster phase for neutral squirmers whereas strong pushers and pullers more gradually approach the hexagonal cluster state. Most bacteria at certain stages of their life cycle are able to move actively; they can swim in a liquid or crawl on various surfaces. A typical path of the moving cell often resembles the trajectory of a random walk. However, bacteria are capable of modifying their apparently random motion in response to changing environmental conditions. As a result, bacteria can migrate towards the source of nutrients or away from harmful chemicals. Surprisingly, many bacterial species that were studied have several distinct motility patterns, which can be theoretically modeled by a unifying random walk approach. We use this approach to quantify the process of cell dispersal in a homogeneous environment and show how the bacterial drift velocity towards the source of attracting chemicals is affected by the motility pattern of the bacteria. Our results open up the possibility of accessing additional information about the intrinsic response of the cells using macroscopic observations of bacteria moving in inhomogeneous environments. Recently, inertial mircofluidics has emerged as a promising tool to manipulate complex liquids with possible biomedical applications, for example, to particle separation. Indeed, in experiments different particle types were separated based on their sizes (A.J. Mach, D. Di Carlo, Biotechnol. Bioeng. 107, 302 (2010)). In this article we use a theoretical study to demonstrate how concepts from optimal control theory help to design optimized profiles of control forces that allow to steer particles to almost any position at the outlet of a microfluidic channel. We also show that one specific control force profile is sufficient to guide two types of particles to different locations at the channel outlet, where they can be separated from each other. The particles just differ by their size which determines the strength of the inertial lift forces they experience. Our approach greatly enhances the efficiency of particle separation in the inertial regime. We recorded large data sets of swimming trajectories of the soil bacterium Pseudomonas putida. Like other prokaryotic swimmers, P. putida exhibits a motion pattern dominated by persistent runs that are interrupted by turning events. An in-depth analysis of their swimming trajectories revealed that the majority of the turning events is characterized by an angle of a1 = 180 (reversals). To a lesser extent, turning angles of a2 = 0 are also found. Remarkably, we observed that, upon a reversal, the swimming speed changes by a factor of two on average—a prominent feature of the motion pattern that, to our knowledge, has not been reported before. A theoretical model, based on the experimental values for the average run time and the rotational diffusion, recovers the mean-square displacement of P. putida if the two distinct swimming speeds are taken into account. Compared to a swimmer that moves with a constant intermediate speed, the mean-square displacement is strongly enhanced. We furthermore observed a negative dip in the directional autocorrelation at intermediate times, a feature that is only recovered in an extended model, where the nonexponential shape of the run-time distribution is taken into account. We study the nonlinear dynamics of spherical colloids under the influence of a pressure driven flow at vanishing Reynolds number. The colloids are confined between two parallel planar walls with a distance comparable to the particle diameter and they interact hydrodynamically via the solvent. We show that the bounded Poiseuille flow gives rise to new classes of trajectories resulting in crossstreamline migration. Two particles moving on these new trajectories exhibit either bound or unbound states. In the first case they oscillate on closed trajectories in the center-of-mass frame. 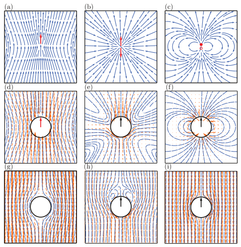 In the second case, they exhibit cross-swapping trajectories in addition to swapping trajectories which were already observed in unbounded or bounded linear shear flow. The different classes of trajectories occur depending on the initial positions of the two particles and their size. We present state diagrams in the lateral positions, where we categorize the trajectories and color code the oscillation frequencies of the bound states. Finally we discuss how the results on the two-particle system help to understand the stability of particle trains composed of several particles. Self-propelled particles in an external gravitational field have been shown to display both an increased sedimentation length and polar order even without particle interactions. Here, we investigate self-propelled particles which additionally are bottom-heavy, that is they feel a torque aligning them to swim against the gravitational field. For bottom-heavy particles the gravitational field has the two opposite effects of i) sedimentation and ii) upward alignment of the particles’ swimming direction. We perform a multipole expansion of the one-particle distribution of non-interacting particles with respect to orientation and derive expressions for sedimentation length and mean particle orientation which we check against Brownian Dynamics simulations. For large strength of gravity or small particle speeds and aligning torque, we observe sedimentation with increased sedimentation length compared with passive colloids but also active colloids without bottom-heaviness. Increasing, for example, swimming speed the sedimentation profile is inverted and the particles swim towards the top wall of the enclosing box. We find maximal orientational order at intermediate swimming speeds for both cases of particles with bottom-heaviness and those without. Ordering unsurprisingly is increased for the bottom-heavy particles, but this difference disappears at higher levels of activity and for very high activities ordering goes to zero in both cases. The motion of self-propelled particles can be rectified by asymmetric or ratchetlike periodic patterns in space. Here we show that a nonzero average drift can already be induced in a periodic potential with symmetric barriers when the self-propulsion velocity is also symmetric and periodically modulated but phase-shifted against the potential. In the adiabatic limit of slow rotational diffusion we determine the mean drift analytically and discuss the influence of temperature. In the presence of asymmetric barriers, modulating the self-propulsion can largely enhance the mean drift or even reverse it. Bacteria propel themselves with the help of rotating helical flagella. They change their swimming direction during tumbling events in order to increase, for example, their supply of nutrients (chemotaxis). During tumbling a bacterial flagellum assumes different polymorphic states. Based on a continuum model for the motor-flagellum system, we demonstrate that a changing motor torque can initiate these polymorphic transformations. In particular, we investigate the run-and-stop tumble strategy of Rhodobacter sphaeroides which uses a coiled-to-normal transition in its single flagellum. We also show that torque reversal in single-flagellated Escherichia coli generates a normal-to-curly I transition as observed for tumbling E. coli that swim with a bundle of several flagella. We study the dynamics of a prolate spheroidal microswimmer in Poiseuille flow for different flow geometries. When moving between two parallel plates or in a cylindrical microchannel, the swimmer performs either periodic swinging or periodic tumbling motion. Although the trajectories of spherical and elongated swimmers are qualitatively similar, the swinging and tumbling frequency strongly depends on the aspect ratio of the swimmer. In channels with reduced symmetry the swimmers perform quasiperiodic motion which we demonstrate explicitly for swimming in a channel with elliptical cross-section. Phasons are special hydrodynamic modes that occur in quasicrystals. 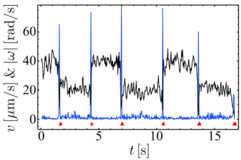 The trajectories of particles due to a phasonic drift were recently studied by Kromer et al. (Phys. Rev. Lett. 108, 218301 (2012)) for the case where the particles stay in the minima of a quasicrystalline potential. 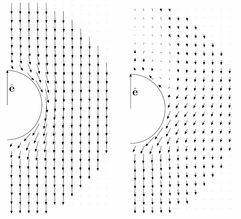 Here, we study the mean motion of colloidal particles in quasicrystalline laser fields when a phasonic drift or displacement is applied and also consider the cases where the colloids cannot follow the potential minima. While the mean square displacement is similar to the one of particles in a random potential with randomly changing potential wells, there also is a net drift of the colloids that reverses its direction when the phasonic drift velocity is increased. Furthermore, we explore the dynamics of the structural changes in a laser-induced quasicrystal during the rearrangement process that is caused by a steady phasonic drift or an instantaneous phasonic displacement. Recently, we have studied the self-assembly of hard needles in a quasicrystalline substrate potential with decagonal symmetry [P. Kählitz and H. Stark, J. Chem. Phys. 136, 174705 (2012)10.1063/1.4711086]. We have identified new structure formation using Monte Carlo simulations. However, hard needles have a zero width. To investigate how the excluded volume of rod-shaped particles influences their phase ordering, we extend here our studies to spherocylinders. We determine phase diagrams and plot them in the relevant variables, strength of substrate potential versus area fraction. At increasing area fraction η short rods form clusters that ultimately destroy directional ordering along the decagonal symmetry directions while surface-induced positional order exists for all η. In contrast, long rods show directional order in the whole density range. However, at high area fractions they assemble into compact clusters which destroy positional ordering. Finally, we also study the rod mobility using the kinetic Monte Carlo method and discuss an unexpected mobility enhancement with increasing density. All these features crucially depend on the non-zero excluded volume of the spherocylinders. Using the method of multi-particle collision dynamics (MPCD), we investigate inertial focussing in microfluidic channels that gives rise to the Segré-Silberberg effect. At intermediate Reynolds numbers, we model the motion of a spherical colloid in a circular microchannel under pressure-driven flow. We determine the radial distribution function and show how its width and the location of its maximum are strongly influenced by the colloid size and the Reynolds number of the Poiseuille flow. We demonstrate that MPCD is well suited for calculating mean values for the lift force acting on the colloid in the cross-sectional plane and for its mean axial velocity. We introduce a Langevin equation for the cross-sectional motion whose steady state is the Boltzmann distribution that contains the integrated lift force as potential energy. It perfectly coincides with the simulated radial distribution function. We consider a population of self-propelled Brownian particles in 2D traps. For noninteracting particles the stationary distribution for position and orientation is found analytically for small and large rotational diffusivities. These results are used to map the system of interacting active particles onto a system of passive particles in a modified trapping potential which we then formulate as a dynamic density functional theory. Our approach is supported by Brownian dynamics simulations of the original and the effective model. Among the distinctive features of quasicrystals—structures with long-range order but without periodicity—are phasons. Phasons are hydrodynamic modes that, like phonons, do not cost free energy in the long-wavelength limit. For light-induced colloidal quasicrystals, we analyze the collective rearrangements of the colloids that occur when the phasonic displacement of the light field is changed. 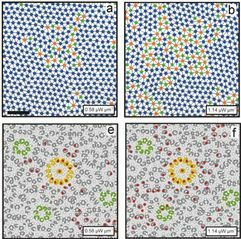 The colloidal model system is employed to study the link between the continuous description of phasonic modes in quasicrystals and collective phasonic flips of atoms. We introduce characteristic areas of reduced phononic and phasonic displacements and use them to predict individual colloidal trajectories. In principle, our method can be employed with all quasicrystalline systems in order to derive collective rearrangements of particles from the continuous description of phasons. We study the three-dimensional dynamics of a spherical microswimmer in cylindrical Poiseuille flow which can be mapped onto a Hamiltonian system. 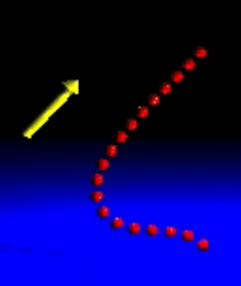 Swinging and tumbling trajectories are identified. In 2D they are equivalent to oscillating and circling solutions of a mathematical pendulum. Hydrodynamic interactions between the swimmer and confining channel walls lead to dissipative dynamics and result in stable trajectories, different for pullers and pushers. 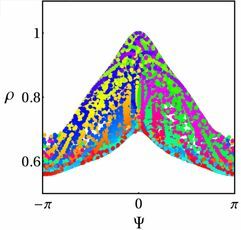 We demonstrate this behavior in the dipole approximation of the swimmer and with simulations using the method of multiparticle collision dynamics. 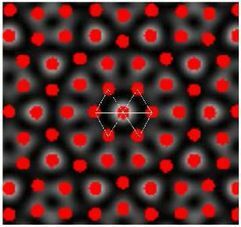 Quasicrystals possess long-range positional and orientational order. However, they cannot be periodic in space due to their non-crystallographic symmetries such as a 10-fold rotational axis. We perform Monte Carlo simulations of two-dimensional hard-needle systems subject to a quasiperiodic substrate potential. We determine phase diagrams as a function of density and potential strength for two needle lengths. With increasing potential strength short needles tend to form isolated clusters that display directional order along the decagonal directions. Long needles create interacting clusters that stabilize the nematic phase. At large potential strengths the clusters position themselves on two interwoven Fibonacci sequences perpendicular to the cluster orientation. Alternatively, one obtains extended domains of needle clusters which are aligned along all decagonal symmetry directions. Various microorganisms use chemotaxis for signaling among individuals — a common strategy for communication that is responsible for the formation of microcolonies. We model the microorganisms as autochemotactic active random walkers and describe them by an appropriate Langevin dynamics. It consists of rotational diffusion of the walker’s velocity direction and a deterministic torque that aligns the velocity direction along the gradient of a self-generated chemical field. To account for finite size, each microorganism is treated as a soft disk. Its velocity is modified when it overlaps with other walkers according to a linear force-velocity relation and a harmonic repulsion force. We analyze two-walker collisions by presenting typical trajectories and by determining a state diagram that distinguishes between free walker, metastable, and bounded cluster states. We mention an analogy to Kramer’s escape problem. Finally, we investigate relevant properties of many-walker systems and describe characteristics of cluster formation in unbounded geometry and in confinement. Many types of bacteria swim by rotating a bundle of helical filaments also called flagella. Each filament is driven by a rotary motor and a very flexible hook transmits the motor torque to the filament. We model it by discretizing Kirchhoff’s elastic-rod theory and develop a coarse-grained approach for driving the helical filament by a motor torque. A rotating flagellum generates a thrust force, which pushes the cell body forward and which increases with the motor torque. We fix the rotating flagellum in space and show that it buckles under the thrust force at a critical motor torque. Buckling becomes visible as a supercritical Hopf bifurcation in the thrust force. A second buckling transition occurs at an even higher motor torque. 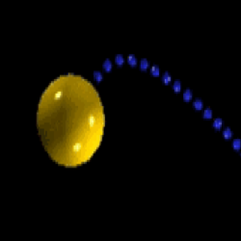 We attach the flagellum to a spherical cell body and also observe the first buckling transition during locomotion. By changing the size of the cell body, we vary the necessary thrust force and thereby obtain a characteristic relation between the critical thrust force and motor torque. 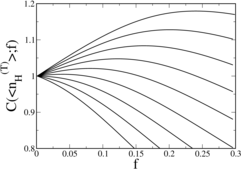 We present a elaborate analytical model for the buckling transition based on a helical rod which quantitatively reproduces the critical force-torque relation. Real values for motor torque, cell body size, and the geometry of the helical filament suggest that buckling should occur in single bacterial flagella. We also find that the orientation of pulling flagella along the driving torque is not stable and comment on the biological relevance for marine bacteria. We develop a minimal model for the stochastic dynamics of microorganisms where individuals communicate via autochemotaxis. This means that microorganisms, such as bacteria, amoebae, or cells, follow the gradient of a chemical that they produce themselves to attract or repel each other. A microorganism is represented as a self-propelled particle or walker with constant speed while its velocity direction diffuses on the unit circle. We study the autochemotactic response of a single self-propelled walker whose dynamics is non-Markovian. We show that its long-time dynamics is always diffusive by deriving analytic expressions for its diffusion coefficient in the weak- and strong-coupling case. We confirm our findings by numerical simulations. The growth of bacterial flagellar filaments is a self-assembly process where flagellin molecules are transported through the narrow core of the flagellum and are added at the distal end. To model this situation, we generalize a growth process based on the TASEP model by allowing particles to move both forward and backward on the lattice. The bias in the forward and backward jump rates determines the lattice tip speed, which we analyze and also compare to simulations. For positive bias, the system is in a non-equilibrium steady state and exhibits boundary-induced phase transitions. The tip speed is constant. In the no-bias case we find that the length of the lattice grows as N(t)∝sqrt(t), whereas for negative drift N(t)∝ln t. The latter result agrees with experimental data of bacterial flagellar growth. Recently, the steady sedimentation profile of a dilute suspension of chemically powered colloids under gravitational field was studied experimentally [J. Palacci et al, Phys. Rev. Lett. 105, 088304 (2010)]. It was found that the sedimentation length increases quadratically with the swimming speed of the active Brownian particles. Here we investigate theoretically the sedimentation of self-propelled particles undergoing translational and rotational diffusion. We find that with increasing sedimentation length the swimming directions of the particles develop polar order against the gravitational field. We suggest realistic parameter values to observe this ordering. Finally, we formulate a dynamic density functional theory for active suspensions under the condition that a non-equilibrium steady state exists. Bacteria such as Escherichia coli propel themselves by rotating a bundle of helical filaments, each driven by a rotary motor embedded in the cell membrane. Each filament is an assembly of thousands of copies of the protein flagellin which assumes two different states. We model the filament by an elastic network of rigid bodies that form bonds with one another according to a scheme suggested by Namba and Vondervistz (1997 Q. Rev. Biophys. 30 1–65) and add additional binding sites at the inner part of the rigid body. Our model reproduces the helical parameters of the 12 possible polymorphic configurations very well. 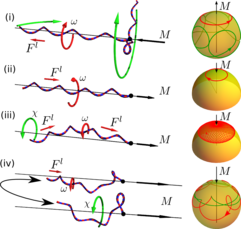 We demonstrate that its energetical ground state corresponds to the normal helical form, usually observed in nature, only when inner and outer binding sites of the rigid body have a large axial displacement. This finding correlates directly to the elongated shape of the flagellin molecule. An Ising Hamiltonian in our model directly addresses the two states of the flagellin protein. It contains an external field that represents external parameters which allow us to alter the ground state of the filament. usion of the average swimming direction. Velocity uctuations are athermal and increase for faster trypanosomes whose trajectories are also straighter. We demonstrate that such a complex behavior is fully captured by two decoupled Langevin equations that decipher the complex trajectory pattern by referring it to the microscopic details of cell behavior. Moreover, the model provides a prediction for the shorter relaxation time beyond experimental resolution. Filaments on the surface of a microorganism such as Paramecium or Ophalina beat highly synchronized and form so-called metachronal waves that travel along the surfaces. In order to study under what principal conditions these waves form, we introduce a chain of beads, called rowers, each periodically driven by an external force on a straight line segment. To implement hydrodynamic interactions between the beads, they are considered point-like. Two beads synchronize in antiphase or in phase depending on the positive or negative curvature of their driving-force potential. Concentrating on in-phase synchronizing rowers, we find that they display only transient synchronization in a bulk fluid. On the other hand, metachronal waves with wavelengths of 7-10 rower distances emerge, when we restrict the range of hydrodynamic interactions either artificially to nearest neighbors or by the presence of a bounding surface as in any relevant biological system. Bacterial flagella assume different helical shapes during the tumbling phase of a bacterium but also in response to varying environmental conditions. Force-extension measurements by Darnton and Berg explicitly demonstrate a transformation from the coiled to the normal helical state (N.C. Darnton, H.C. Berg, Biophys. J. 92, 2230 (2007)). We here develop an elastic model for the flagellum based on Kirchhoff's theory of an elastic rod that describes such a polymorphic transformation and use resistive force theory to couple the flagellum to the aqueous environment. We present Brownian-dynamics simulations that quantitatively reproduce the force-extension curves and study how the ratio $Gamma$ of torsional to bending rigidity and the extensional rate influence the response of the flagellum. An upper bound for $Gamma$ is given. Using clamped flagella, we show in an adiabatic approximation that the mean extension, where a local coiled-to-normal transition occurs first, depends on the logarithm of the extensional rate. Two-dimensional colloidal suspensions subjected to laser interference patterns with decagonal symmetry can form an Archimedean-like tiling phase where rows of squares and triangles order aperiodically along one direction (J. Mikhael et al., Nature 454, 501 (2008)). In experiments as well as in Monte Carlo and Brownian dynamics simulations, we identify a similar phase when the laser field possesses tetradecagonal symmetry. We characterize the structure of both Archimedean-like tilings in detail and point out how the tilings differ from each other. 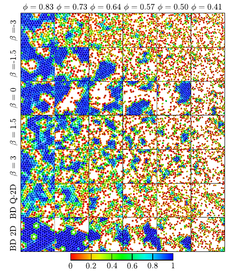 Furthermore, we also estimate specific particle densities where the Archimedean-like tiling phases occur. Finally, using Brownian dynamics simulations we demonstrate how phasonic distortions of the decagonal laser field influence the Archimedean-like tiling. In particular, the domain size of the tiling can be enlarged by phasonic drifts and constant gradients in the phasonic displacement. We demonstrate that the latter occurs when the interfering laser beams are not ideally adjusted. 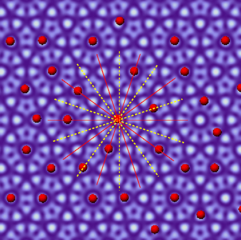 Quasicrystals provide a fascinating class of materials with intriguing properties. Despite a strong potential for numerous technical applications, the conditions under which quasicrystals form are still poorly understood. Currently, it is not clear why most quasicrystals hold 5- or 10-fold symmetry but no single example with 7- or 9-fold symmetry has ever been observed. Here we report on geometrical constraints which impede the formation of quasicrystals with certain symmetries in a colloidal model system. Experimentally, colloidal quasicrystals are created by subjecting micron-sized particles to two-dimensional quasiperiodic potential landscapes created by n = 5 or seven laser beams. Our results clearly demonstrate that quasicrystalline order is much easier established for n = 5 compared to n = 7. With increasing laser intensity we observe that the colloids first adopt quasiperiodic order at local areas which then laterally grow until an extended quasicrystalline layer forms. 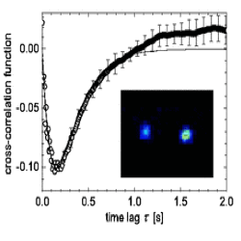 As nucleation sites where quasiperiodicity originates, we identify highly symmetric motifs in the laser pattern. We find that their density strongly varies with n and surprisingly is smallest exactly for those quasicrystalline symmetries which have never been observed in atomic systems. 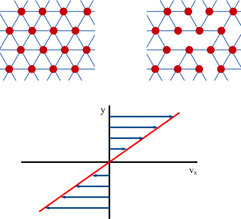 Since such high-symmetry motifs also exist in atomic quasicrystals where they act as preferential adsorption sites, this suggests that it is indeed the deficiency of such motifs which accounts for the absence of materials with e.g., 7-fold symmetry. We discuss the modelling of a microswimmer that operates in a 'squirmer' mode, by means of stochastic rotation dynamics. The squirmer that we model can easily be tuned between a 'pusher' and a 'puller'. We examine the flows produced by the squirmer and find that there is good agreement between both the predicted and simulated velocities of locomotion and the resulting flow field. By numerical modeling we investigate fluid transport in low-Reynolds-number flow achieved with a special elastic filament or artifical cilium attached to a planar surface. The filament is made of superparamagnetic particles linked together by DNA double strands. An external magnetic field induces dipolar interactions between the beads of the filament which provides a convenient way of actuating the cilium in a well-controlled manner. The filament has recently been used to successfully construct the first artificial micro-swimmer (R. Dreyfus et al., Nature 437, 862 (2005)). In our numerical study we introduce a measure, which we call pumping performance, to quantify the fluid transport induced by the magnetically actuated cilium and identify an optimum stroke pattern of the filament. It consists of a slow transport stroke and a fast recovery stroke. Our detailed parameter study also reveals that for sufficiently large magnetic fields the artificial cilium is mainly governed by the Mason number that compares frictional to magnetic forces. Initial studies on multi-cilia systems show that the pumping performance is very sensitive to the imposed phase lag between neighboring cilia, i.e., to the details of the initiated metachronal wave. has to distinguish between dry and wet interfaces. 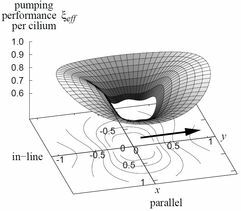 We study the beating kinematics and pumping performance of a magnetically actuated artificial cilium attached to a surface using a bead spring model. Several different beating patterns for the external field are considered along with the possiblity of defects in the filament at isolated points. 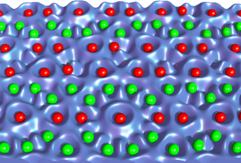 Hydrodynamic interactions between the beads are included by a modified Rotne-Prage tensor such that the no-slip boundary condition at the surface is satisfied. We find that the correct positioning of defects along the filament length can lead to significant increases in the pumping performance of a planar beating pattern. Even more efficient for pumping fluid are three-dimensional beating strokes which bring the filament close to the surface during the return part of the stroke. We consider a random walk model that takes into account the velocity distribution of random walkers. Random motion with alternating velocities is inherent to various physical and biological systems. Moreover, the velocity distribution is often the first characteristic that is experimentally accessible. Here, we derive transport equations describing the dispersal process in the model and solve them analytically. 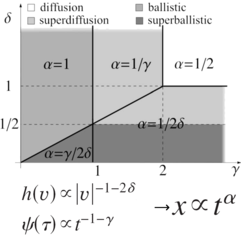 The asymptotic properties of solutions are presented in the form of a phase diagram that shows all possible scaling regimes,including superdiffusive, ballistic, and superballistic motion. The theoretical results of this work are in excellent agreement with accompanying numerical simulations. By using Monte Carlo simulations, we study the complex phase behavior of charged-stabilized colloidal particles in a two-dimensional substrate potential with quasicrystalline decagonal symmetry. In the regime where the strengths of the substrate and colloidal pair potential are comparable, we identify a novel and unexpected quasicrystalline phase with pure 20-fold bond order and a disordered structure without any apparent rotational symmetry. Furthermore, we demonstrate how phasonic displacements in the substrate potential induce phasonic flips in the colloidal monolayer. Die Natur hat ausgeklügelte Mechanismen entwickelt, mit denen sich Mikroorganismen wie Bakterien und Spermien in wässriger Lösung fortbewegen oder mit denen sich auf Mikrometerskala Flüssigkeit transportieren lässt, z. B. beim Abtransport von Schleim in der Lunge. Ein tieferes Verständnis der physikalischen Grundlagen dieser Mechanismen ist nicht nur von physiologischer Bedeutung, sondern hilft auch dabei, Mikrometer große künstliche Schwimmer zu konstruieren oder in der technologisch wichtigen Mikrofluidik winzige Flüssigkeitsmengen zu bewegen und zu mischen. 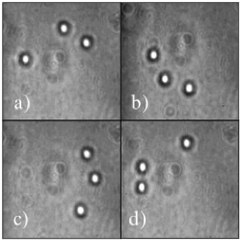 The elastic properties of fcc crystals consisting of charged stabilized colloidal particles are determined from real space imaging experiments using confocal microscopy. The normal modes and the force constants of the crystal are obtained from the fluctuations of the particles around their lattice sites using the equipartition theorem. We show that the Cauchy relation is not fulfilled and that only noncentral many-body forces can account for the elastic properties. Using Monte-Carlo simulations and an extended Landau-Alexander-MCTague theory, we demonstrate that colloids in a one-dimensional quasicrystalline potential order in triangular and rhombic-alpha crystalline phases. Increasing the strength of the potential further, a new type of light-induced melting is discovered that has its origin in the non-periodicity of the potential. In contrast to reentrant melting in periodic potentials, the quasicrystalline potenial melts the crystalline phases even when they already exist at zero potential. By combining optical tweezers with polarization microscopy, the hydrodynamic coupling between position and orientation fluctuations in a pair of colloidal spheres has been measured. Imaging of birefringent particles under crossed polarizers allows for the simultaneous determination of the positions and orientations of both particles. The temporal cross-correlation function between random displacements of one particle and orientation fluctuations of its neighbor allows for the quantification of the hydrodynamic rotation-translation coupling between the spheres. Our results are in good agreement with predictions for the hydrodynamic mobility tensors calculated in the creeping-flow limit of the Navier-Stokes equation. We present a detailed numerical study of a microscopic artificial swimmer realized recently by Dreyfus (em et al.) in experiments [R. Dreyfus (em et al. ), Nature, 437, 862 (2005)]. It consists of an elastic filament composes of superparamagnetic particles that are linked together by DNA strands. Attached to a load particle, the resulting swimmer is actuated by an oscillating external magnetic field so that it performs a non-reciprocal motion in order to move forward. We model the superparamagnetic filament by a bead-spring configuration that resists bending like a rigid rod and whose beads experience friction with surrounding fluid and hydrodynamic interactions with each other. We experimentally and theoretically investigate the collective behavior of three colloidal particles that are driven by a constant force along a toroidal trap. 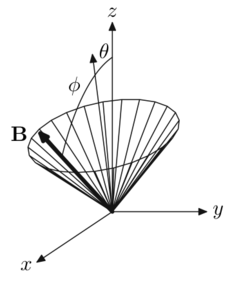 Due to hydrodynamic interactions, a characteristic limit cycle is observed. When we additionally apply a periodic sawtooth potential, we find a novel caterpillar-like motional sequence that is dominated by hydrodynamic interactions and promotes the surmounting of potential barriers by the particles. We investigate particle transport in the honeycomb billiard that consists of connected channels placed on the edges of a honeycomb structure. The spreading of particles is superdiffusive due to the existence of ballistic trajectories which we term perfect paths. 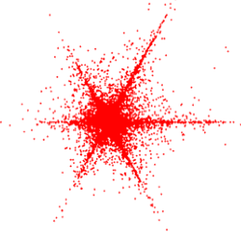 Simulations give a time exponent of 1.72 for the mean square displacement and a starlike, i.e., anisotropic particle distribution. We present an analytical treatment based on the formalism of continuous-time random walks and explain both the time exponent and the anisotropic distribution.